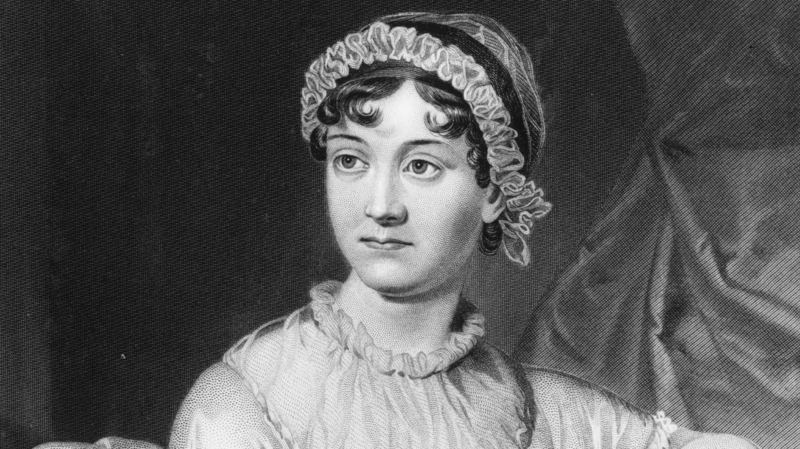 Book News: Fragment Of Jane Austen's Handwriting Found : The Two-Way Also: a new Zadie Smith story; Stephen King will publish a new book; two poems written by David Foster Wallace as a child. A small but rare sample of Jane Austen's handwriting has been found tucked into another book at the Jane Austen's House Museum. The scrap reads, "Men may get into a habit of repeating the words of our Prayers by rote, perhaps without thoroughly understanding — certainly without thoroughly feeling their full force & meaning." It is thought to be a passage from one of her brother's sermons, rather than her own composition, though the museum's curator, Mary Guyatt, told The Guardian, "What especially intrigued us about this fragment is its apparent date, 1814, and the evidence that offers of the cross-currents between Austen's family life and her literary reflections on prayer in Chapter 34 of Mansfield Park, published the same year." Writing on the back of the scrap of paper is less legible, but scholars plan to use humidity to try to clean the paper and decipher it. Zadie Smith has a new short story, "Moonlit Landscape With Bridge," about a government official fleeing his country after a disaster: "The Minister had not ventured outside in three days. Yet the scrolling devastation held few surprises, maybe because the foreign news crews filmed in just this way, from the window of a moving vehicle. For the first mile or so, the magnitude of what had happened was not obvious. Up here, the storm had knocked down only every third tree, blown out a few windows, and driven a stone general and his horse nose first into the ground. By the time they reached the valley, however, any hope one had that the television exaggerated was destroyed." Stephen King is expected to come out with a new book, called Mr. Mercedes, this summer. A description from his publisher begins, "In the frigid pre-dawn hours, in a distressed Midwestern city, hundreds of desperate unemployed folks are lined up for a spot at a job fair. Without warning, a lone driver plows through the crowd in a stolen Mercedes, running over the innocent, backing up, and charging again. Eight people are killed; fifteen are wounded. The killer escapes." Open Culture features two poems written by David Foster Wallace as a child. In one, he dispenses some sage advice on the subject of Vikings: "If you were to see a Viking today/ It's best you go some other way." Ocean Vuong has a gorgeous new poem in Poetry Magazine called "Aubade with Burning City." It's set during the fall of Saigon, when the song "White Christmas" was the signal the American army used to begin evacuations. Vuong writes: "to hear sleigh bells in the snow.../ In the square below: a nun, on fire, runs silently toward her god."